Rebuilt in 1916 after a devastating fire, St Dunstan’s Basilica now stands tall and proud , making Charlottetown’s skyline a little more breathtaking. 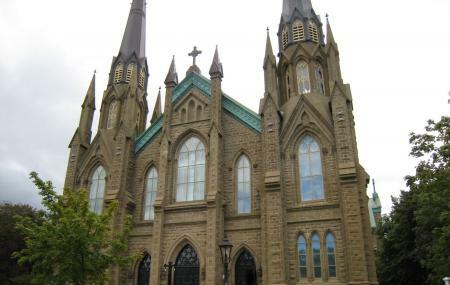 St. Dunstan's Cathedral Basilica is a stone French Gothic church and one of the finest maritime churches in Canada. Absolutely gorgeous from inside, the church’s altar and ceiling are its most striking features. Bathed in marble and home to a glorious pipe organ, this imposing structure is beautiful inside out. The intricate carvings inside the church beckon visitors from all over the world again and again. How popular is St. Dunstan's Basilica? People normally club together Confederation Centre Of The Arts and Red Shores Racetrack And Casino while planning their visit to St. Dunstan's Basilica. Beautiful serene atmosphere. Open until 5 pm weekdays. Sunday mass at 10am and 5pm. Its a history place . If you are stressed and need some calm environment go here. It has an adoration chapel on the side which is also open with a security code. Wonderful cathedral - probably the best in the Maritimes, certainly the grandest. It is something that must be seen to be truly appreciated, and if you are in the area don't think about passing it by. One thing to be cautious of is the fact that it gets very busy in the summer months. Parking is rare to find, so maybe plan ahead. A beautiful cathedral, inside and out. Admission was free but donations were accepted. They ask that you dress respectfully and not take pictures while services are in session (both very reasonable requests). You can walk right up to the front and see the sculptures and everything up close. Very close to a number of other downtown attractions - worth a visit. This was great soon as I asked jesus to forgive me for all badness he said notta prob dan. Polished my halo and off I went!!! A short walk from the port This Basilica stand out, gracefully and beautifully in the old town of Charlottetown! I truly enjoyed the stain glass panels and the various alters! Don’t miss the carved in wood last supper under the main alter!